Hi Everyone! 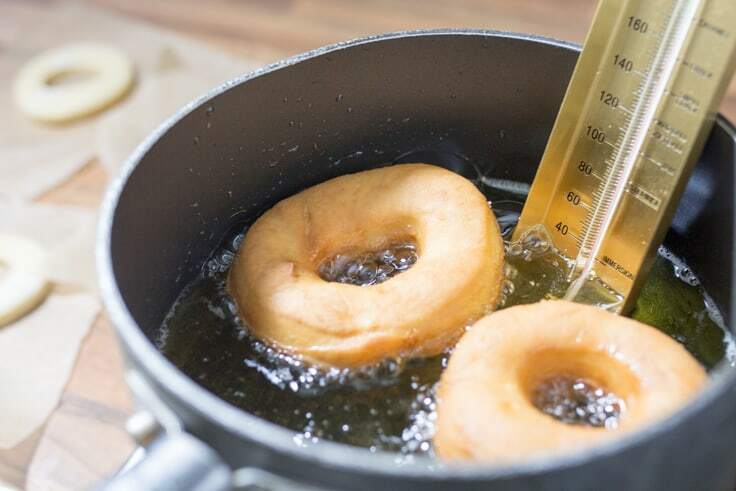 Nicky here from Kitchen Sanctuary – calling in with a recipe for these delicious glazed donuts. 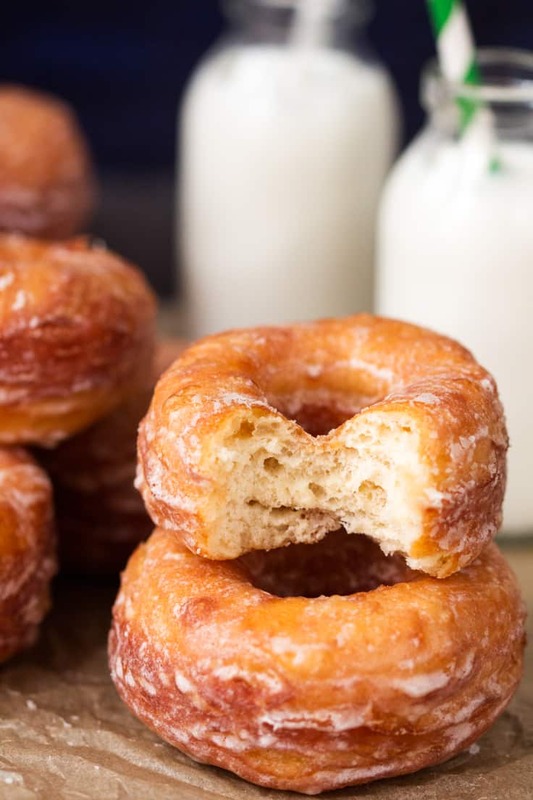 Soft and light, with a glaze that crinkles and melts into your mouth as you take a bite, you’ll find it hard to stop at one. When I last made these, I made a batch of 24. They were gone embarrassingly quickly for a family of four! So now I try to make them in batches of 12, and at least try to make them last a couple of days. They do taste better on the day they’re made, but honestly, who’s going to turn down a homemade donut, even if it is 24 hours old! A donut cutter (easily picked up at homewares shops and Amazon). Alternatively, you could use a large glass to cut out the outer circle and an egg cup to cut out the inner circle. A candy or pan thermometer. It’s quite important to have the oil at the right temperature so the donuts don’t burn on the outside whilst still being doughy in the middle. It’s also a good idea to use wooden chopsticks to help turn the donuts over in the oil and to dip the donuts in the glaze. Have 12 little pieces of baking parchment ready – one for each donut. When you cut out the donuts, place them straight on their own piece of parchment and leave them to rise for 30-40 minutes before cooking them. Having the donuts on their own piece of parchment mean that you can easily slide the donuts into the hot oil without having to handle them. I use one hand to hold the edge of the parchment and a place one of the chopsticks underneath, then lower the donut in carefully. It should peel itself off the paper with a little jiggle. Nicky lives in Cheshire in the UK with her husband and two children. She blogs over at Kitchen Sanctuary where she creates family friendly recipes and mouth-watering photos. Connect with Nicky on Facebook, Instagram, Pinterest and Twitter. 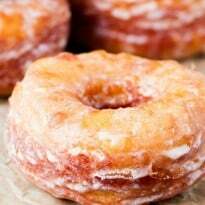 The most delicious recipe for Glazed Donuts ever! Heat the milk until just about to boil, then turn off the heat and leave to cool to a lukewarm temperature. Place the yeast in a small bowl with the warm water. Mix and leave for 3-4 minutes until frothy. Place your milk, yeast, sugar, egg, egg yolk, butter, salt and half the flour into the bowl of a stand-mixer. 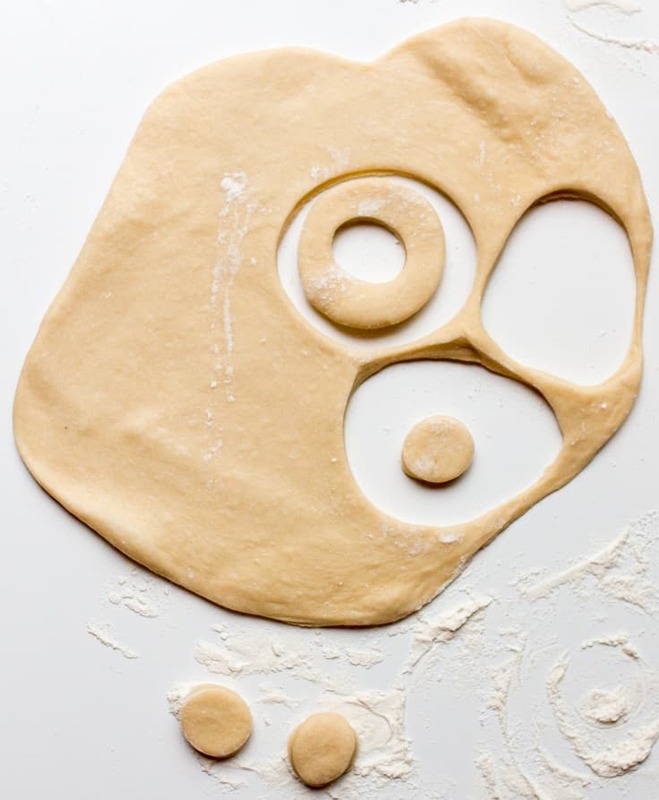 Mix together for a minute (using the dough hook) until combined. Add in the rest of the flour and mix on a medium speed for 4-5 minutes. The dough should smooth and a little sticky. Place the dough into a lightly oiled bowl and cover with clingfilm/plastic wrap. Leave to prove at room temperature until doubled in size (about 60-90 minutes). Tip the dough out onto a lightly floured surface and knead a few times to punch out the air bubbles. Roll the dough out with a rolling pin until it’s approximately ½” thick. Use a donut cutter – that’s been dipped in flour – to cut 12 donuts. You’ll have to re-roll the dough a couple of times to achieve this. Place each donut on a separate little piece of baking parchment (having them on individual pieces makes it easier to pick up and lower each donut into the oil later) and cover with some lightly oiled clingfilm/plastic wrap. Leave to prove for a further 30-40 minutes. Pour your oil into a large pan and heat to 160c/320f. Use a thermometer and try to keep your oil temperature as constant as possible. Whilst the oil is heating, make your glaze. Place the melted butter in a medium-sized bowl, stir in the confectioner’s sugar and vanilla extract using a small hand whisk. Stir in 2 of the tablespoons of water and test thickness of the glaze. It should coat the back of a spoon, but you should still be able to see the color of the spoon through the glaze. Add the remaining tbsp. of water if required. Put the bowl on the work surface near the pan of oil. Cook donuts two or three at a time – gently lowering each one into the pan holding the edge of the baking parchment in one hand and using a chopstick, spoon or palette knife in the other. Cook for approx. 2 minutes – until dark golden brown – then flip over using a wooden chopstick. Cook for a further 1-2 minutes. 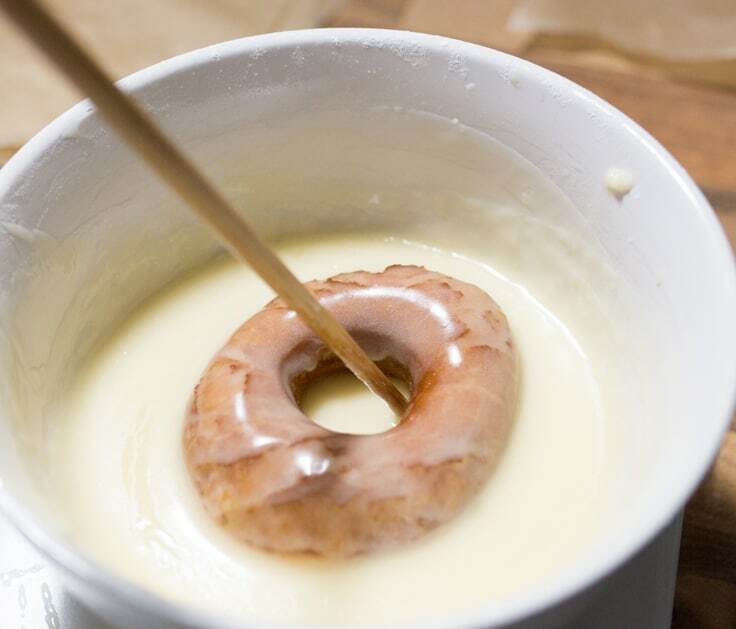 Once cooked, remove the donuts (one at a time) from the oil, and immediately dip it in the glaze. Turn it over using a chopstick, to ensure it’s fully coated. Remove from the glaze and place on a cooling rack. Repeat with the remaining donuts. Leave to cool for at least 30 minutes – to give the glaze time to set. These donuts are best eaten on the same day. They’d be devoured here within minutes of being cooked. My guys would be pretty happy if I made a batch or 2. Great recipe! I love doughnuts and these sound fantastic. I’ll have to keep an eye out for a thermometer though. I have never made donuts but it would be fun to one day; I am sure they would be gone pretty quick! 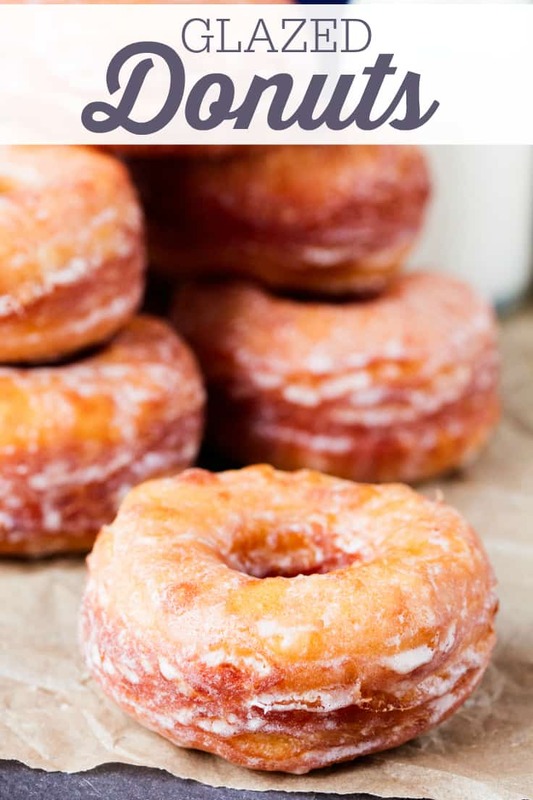 i love donuts and i love the food photography. therefore i love this post. I’ve never made doughnuts before. The pictures you included were very helpful in explaining the recipe. Sometimes you just want a good doughnut like this! Yes please! Donut day is coming up, and these look amazing. Thanks. Mmmm they look so good!! I have made donuts before and they need to be eaten the same day, but oh are they so good!!! Oh those look amazing! thank you. I’d love to try making my own donuts. Thanks for the recipe!! Oh wow 🙂 Your photos just make me crave a good old fashioned glazed donut! So simple too 🙂 Thanks for sharing! It was so brave of you to give Donuts a try!!! I get nervous just baking muffins…even though the mix is bought from the store! LOL I may not attempt these myself…but, pass this recipe on to my mother, who is a much better cook than me! Congratulations! And, “Thanks!” for the recipe! Hold the phon!e!!! Those look so good! I’m going to try these this afternoon! I made these today and they were wonderful. My family gobbled them up quickly. I did find however that the dough was very wet and I had to add about 1/2 cup additional flour to make the dough workable. Other than that, I followed the recipe exactly and they turned out great. I like that you fry them at a lower temp. I made homemade donuts previously and didn’t care for the “fried” taste of them, but I think by keeping the temperature at 320, that was the trick to a great donut. 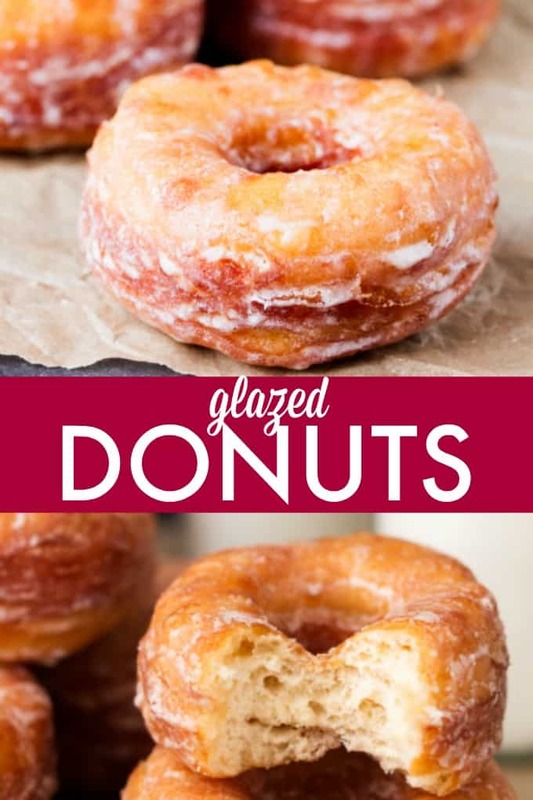 These homemade glazed donuts sound amazing! Oh these look amazing… the glaze is gorgeous! I absolutely love donuts and these look fabulous!! It might be a little too dangerous to start making them at home though! These look and sound absolutely delicious! My grandmother used to make doughnuts from scratch and they were so good. Thanks for the fun recipe! OMgoodness! These look soooo darn yummy! Visiting from Create & Share DIY and Recipe Party.Thanks so much for sharing. 😉 Pinning! Delicious, divine donuts! Happy National Donut Day! I want to try these! I bought a donut baking pan awhile ago and have never used it. Wonder if these would work baked? Recipe printed! Thanks for this tutorial, but, sheesh, you’re hard on my waistline, darling. Howdy NIcky! I’m visiting via Inspire Me Monday. First up, I saved your recipe because DH is a donut fanatic. I’m not going to lie to you, he along can eat easily 8 hot glazed donuts from Krispy Kreme and between us we could polish off a whole dozen, if we let ourselves do it. I know what you’re thinking these people must be ginormous in size. DH has a metabolism like gerbil running on wheel or something. Mine isn’t quite so fast and I DO have to be careful with eating high cal foods. Thankfully, I’m not as nuts-o over donuts like he is or else I’d be in BIG trouble. 😀 Your donuts look fabulous and I will definitely try making your recipe. Have a super day! Oh Lord these look way too good! Why can’t there be a low calorie donut??? Wow! I always hesitate to deep-fry anything just because I don’t feel I’m going to do enough of it to make it worth using a whole pan of oil… but those look good enough to temp me into forgetting that.